I picked up a head of organic local cabbage from a Farmer’s Market on Saturday. I just had to make some homemade Sauerkraut. This recipe comes from Nourishing Traditions. ~In a bowl mix cabbage, salt, and whey. Pound with a wooden pounder (spoon in my case) for 10 minutes. Place in mason jar and press down firmly with spoon until juices come to the top. 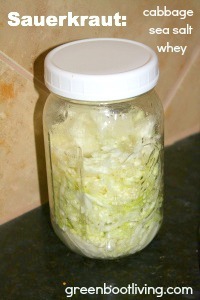 The top of cabbage should be at least 1 inch below the top of the jar. Cover tightly and keep at room temperature for about 3 days (2 for Florida ). Transfer to cold storage. May be eaten immediately, but improves with age.